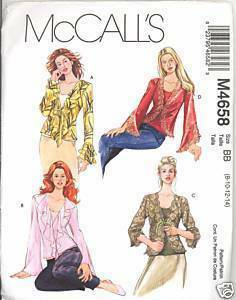 A McCall’s 4658…a Misses’ Tops and Bias Tank Top Sewing Pattern in Sizes 8, 10, 12 and 14. The pattern is uncut and in factory folds. The instructions are all there. The envelope is in excellent condition. The envelope flap is still attached with the original price. Copyright 2004. Pattern Description “Tops A, B are close fitting and have neck flounce, front and back darts, front opening, long sleeves; tops C, D are close fitting and have front and back darts, front opening, lace trimmed outer edges; top C has three-quarter length sleeves with lace trim; tops A, C have ribbon ties; tops B, D have hook and eye closure; top D has long pointed sleeves trimmed with lace.” Sizes 8-14: Bust 31 ” – 36”, Waist 24” – 28”, Hip 33 ” – 38” All patterns are vintage items and sold…AS IS. Although I maintain a smoke-free and a pet-free studio, I have no control over where items have been previously. I attempt to represent my goods as honestly as possible, but sometimes something will get by. If you have any doubts about an item, E-MAIL ME! I want to make sure that you will be pleased with your purchase. I will make a refund as merchandise credit; buyer pays for return shipments. Pattern comes in a zip 2 mil. plastic bag and is shipped in an envelope with a cardboard insert. The zip bag is great for storing the pattern! Please note that I count the pattern pieces unless factory folded, assess the pattern’s condition and press the pattern as necessary. You will never purchase a pattern from me with “It looks like it's all there” or ‘Pieces need pressing’.